According to a Report, Microsoft has continue to lose money on its Surface tablets throughout its just-concluded 2014 fiscal year, adding hundreds of millions of dollars in red ink and boosting total losses to $1.7 billion since the device's 2012 launch. According to the 8-K statement filed with the U.S. Securities and Exchange Commission (SEC) on July 22, the Surface posted revenue of $409 million for the quarter that ended June 30. But unlike the two quarters prior, Microsoft did not reveal the cost of revenue associated with the Surface for the period. Without a cost of revenue figure, it is impossible to calculate a precise gross margin, a rough measurement of profit. However, using information in the 10-K that Microsoft filed last Friday, along with data from earlier reports, it is possible to estimate Surface cost of revenue. But really: Why Windows Phone? Calculations by Computerworld show that the Surface's cost of revenue for the June quarter was $772 million. With revenue of $409 million, that put the tablet in the red to the tune of $363 million, the largest one-quarter loss for the Surface since Microsoft began providing quarterly revenue numbers. Jan Dawson, chief analyst at Jackdaw Research, figured the June quarter's cost of revenue at a slightly different $733 million, for a loss of $324 million. Some of the money in the cost of revenue -- and thus in the negative gross margin, or loss -- was due to a write-off Microsoft took for the quarter. The write-off, which wasn't tied to a dollar amount, was to cover costs of designing and producing an unknown number of Surface Mini tablets. "Current year cost of revenue included Surface inventory adjustments resulting from our transition to newer generation devices and a decision to not ship a new form factor," the company said in the July 22 8-K (emphasis added). Microsoft was set to launch the smaller-screen Surface Mini alongside the Surface Pro 3 in May, but changed its mind at the last moment, reportedly because it feared the tablet would not sell well. Also in that red ink, said Dawson in a Monday interview, were manufacturing expenses for the Surface Pro 3 line, which Microsoft started selling, but only in limited quantities, near the end of quarter. Although most sales would presumably be recorded in the following quarters, the initial production costs would have been booked into the June period. The fully-fleshed-out line only reached retail on Aug. 1. Adding the $772 million in Q4 to the preceding three quarters' cost of revenue resulted in a total of $2.872 billion for Microsoft's 2014 fiscal year (FY2014), which ran from July 1, 2013 to June 30, 2014. 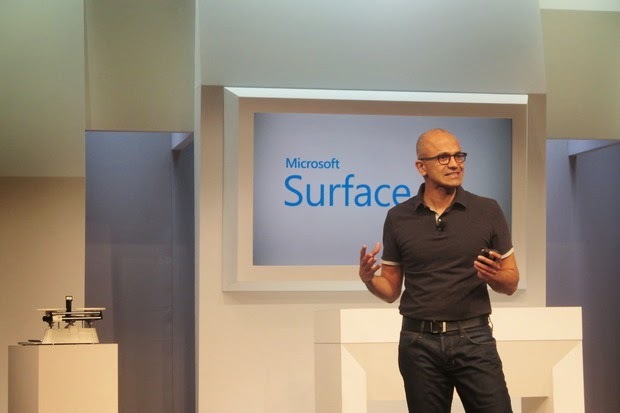 During the same stretch, Microsoft reported $2.192 billion in Surface-derived revenue.